EPP (B1, B2), REQUIRES AP V05.00.12 OR HIGHER. 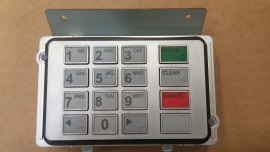 THIS KEYPAD WILL NOT WORK ON MONO/COLOR 5.7 INCH SCREEN MACHINES. Does not come with bracket. Return of non working Hantle or Genmega pin pad required. If not returned or unable to repair a charge of $100.00 will be charged to your card or account.